Iris-based biometric authentication specialist EyeLock has signed an agreement with ViaTouch Media that will integrate EyeLock’s iris recognition technology within ViaTouch’s smart-shelf vending solution, Vicki. EyeLock’s iris authentication will be deployed as part of the interface for Vicki (ViaTouch Intellishelf Cognitive Kinetic Interactions), a smart shelf vending machine with an AI-enabled shopping assistant. Formerly known as Lisa, Vicki engages consumers by authenticating them, learning their preferences, providing loyalty, rewards, and discounts, and using smart shelf technology to note what products shoppers are viewing as well as which they are selecting and deselecting. The virtual clerk-powered machine communicates using directional speakers so that only the person standing in front of it can hear the conversation. Founded in 2006 and headquartered in New York City, Eyelock demonstrated its USB-powered Iris Identity Authenticator, myris, at FinovateFall 2014. A majority-owned subsidiary of Voxx International Corporation, the company announced a trio of new patents last month, affirming the company’s innovations in iris and facial imaging, biometric matching, and visual guidance in gaze alignment. EyeLock has spent much of 2017 forging major partnerships that will bring its full suite of hardware and software access control solutions to customers throughout North America and around the world. In October, EyeLock teamed up with Australian security solutions vendor, CSD (Central Security Distribution), and in August, the company signed a licensing agreement that will enable the company to build iris authentication solutions for Qualcomm Technology’s Qualcomm Mobile Security platform. A May partnership with STANLEY Security, an integrated security solutions provider and division of Stanley Black & Decker, rounds out a busy year of partnerships for EyeLock. There are plenty of reasons I stopped using my bank’s finicky iris-scanning mobile-authentication technology to log in and check my account balance. Plagued with issues caused by glasses, glare and sunlight, I switched to using a 4-digit PIN for the foreseeable future. This week iris authentication company EyeLock released a new technology to remove some of the friction associated with the technology and boost adoption rates. EyeLock owns and controls the entire software and algorithm stack, which helps it to create a more secure solution. Founded in 2006, the company has raised $3 million in funding. At FinovateFall 2014 the company debuted myris, a USB-powered identity authenticator that converts a user’s iris into a unique, encrypted code for secure website access. Earlier this year, EyeLock opened an IoT Center of Excellence to further develop and expand the distribution of its iris-scanning technologies. In late 2015 the company teamed up with Diebold to create a new concept ATM that connects to the user’s smartphone instead of using a PIN pad, card reader, or screen. Blackhawk Network acquires GiftCards.com and OmniCard for $120 million. ID.me adds support for logins via social media. EyeLock partners with Diebold to develop new ATM experience using mobile app, QR codes, and iris scanning. Trustly partners with GoldMoney’s BitGold to connect with financial institutions for direct deposits and redemptions. LiveRamp interviews Cardlytics CMO Dani Cushion. The Finovate Debuts series introduces new Finovate alums. 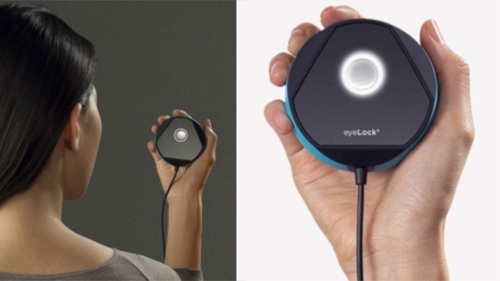 Today’s feature is EyeLock, which demonstrated its myris eye scanning device at FinovateFall 2014. EyeLock links a user’s password to their iris template, enabling them to log into their computer, websites, and applications by scanning their iris on the myris device. myris is an iris-scanning device that plugs into the USB port on a user’s computer and authenticates them by taking a video of their iris. EyeLock associates the iris template with a long and complex password. Upon first setting up their account on the device, users generate their unique iris ID, then select operating systems, websites, and applications they’d like to log into using myris. From then on, all they need to do to log into those sites is glance at the myris device. 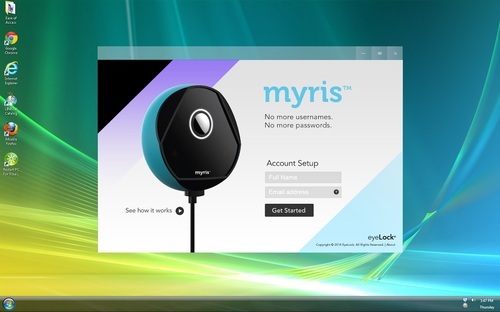 With the myris application on their computer, combined with the hand-held device, users manage login permissions for myris, as well as multiple users for a single account. 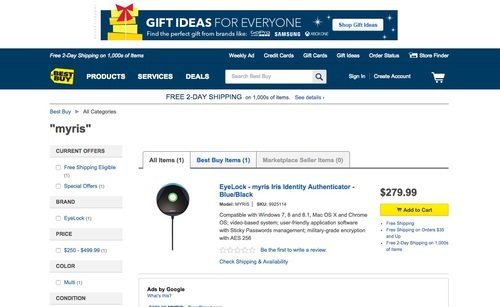 With the Sites tab, users scan their iris to log in automatically to websites such as Facebook and PayPal. 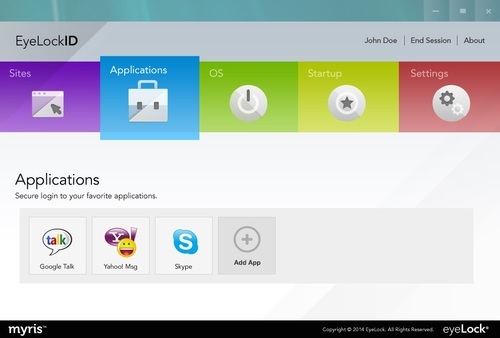 The Applications tab enables users to securely log into applications such as Skype and Spotify, while the Operating System tab lets users opt to log into their computer using myris. EyeLock supports Windows, Linux, and Mac operating systems. 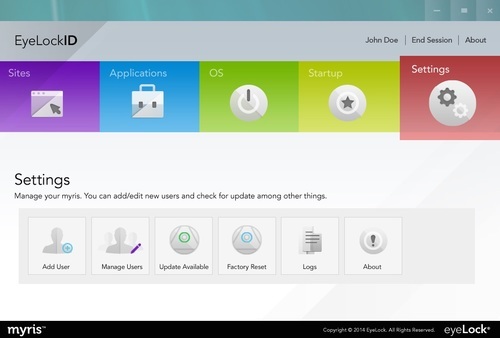 With the Startup tab, the user selects which sites and applications to launch automatically upon turning on their computer. This Autolaunch feature lets users select any number of sites they would like to open simultaneously after authenticating themselves with myris. The Settings tab is exactly what it sounds like. Users download system updates, add and manage multiple user permissions for shared accounts, and view their account login history. Since the user’s iris is always with them and is exclusively theirs, myris eliminates the risk associated with lost, stolen or shared login credentials and ID cards. Additionally, scanning an iris is faster than typing in a username and password. In addition to the digital realm, eyeLock has products that authenticate users on a commercial level to allow access into physical barriers, such as restricted buildings or conference rooms. Check out Eyeswipe-Nano, Eyeswipe-Nano TS, nano NXT and HBOX. EyeLock demonstrated its myris authentication device at FinovateFall 2014.